According to Breitbart News, which took a good look at it. 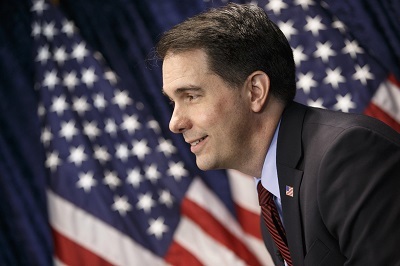 Walker also said in the interview that he would “absolutely” repeal Common Core in Wisconsin. Jeb Bush is, of course, a huge proponent of Common Core. So, whatever our worries were about Walker on immigration, I think now we can relax. The only trouble now is getting the electorate to care more about accomplishments than charisma. But if the fight is between Walker and Clinton, I have no doubt that Clinton’s “entitled” attitude is going to lose her the election. No matter how much money she has. And remember that Walker is able to speak to any issue in a way that is persuasive to independents – he proved that in Wisconsin. While Hillary is taking about “equal pay” and smashing the glass ceiling, Walker’s going to be cleaning up on the issues middle-class Americans care about. Chins up, buttercups! Things are looking good for our side. Why didn’t Scott Walker finish his fourth year of college at Marquette University? Previous PostDo tax hikes, welfare spending and minimum wage hikes lower income inequality?Next PostWhat should we do to encourage men to marry?